Ocean Shores, Washington is a funky beachfront town perched on a narrow peninsula that juts out of the southwest corner of the state. 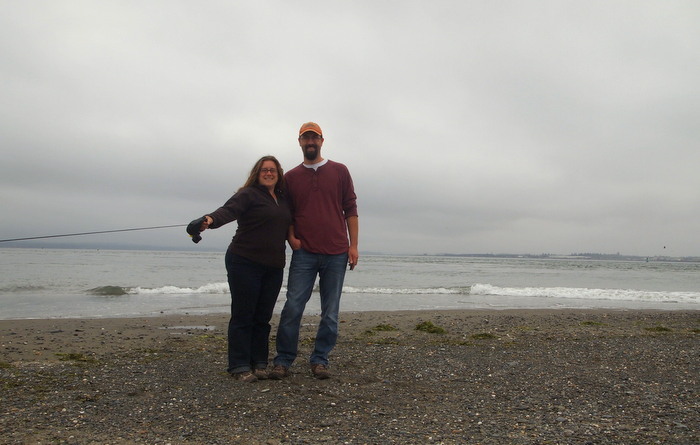 We recently spent three days there enjoying an ocean view at the Quinault Marina and RV Park. 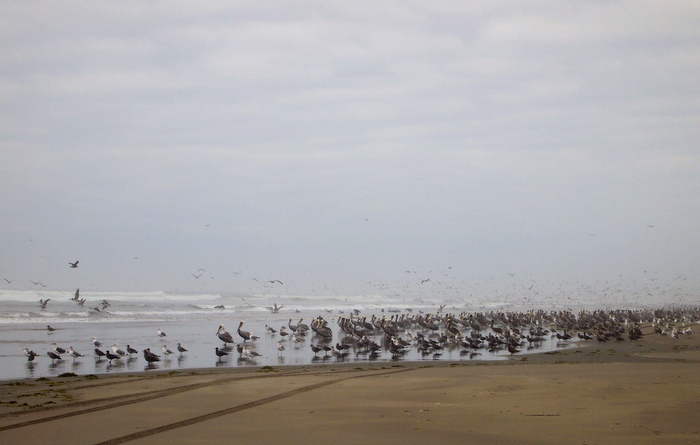 Ocean Shores is an eclectic little town with local art galleries, surf shops and kite stores wedged into 1970s style strip malls alongside nail saloons and sports bars. This time of year the town emits a sleepy, tired feel. Not a lot going on as tourist season comes to an end. 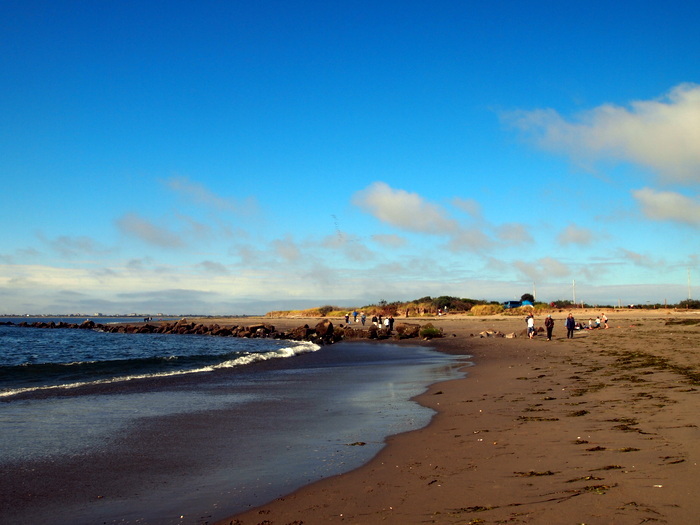 But the endless stretches of sandy beach that draw in the visitors are still fantastic even as the cold weather looms. At the end of September the fog is dense and the temperature so low that you need a thick sweater to walk the shore, but the enticing beauty of this place remains. The Quinault Marina and RV park is not a fancy campground with irrigated landscaping and a long list of amenities — or even basic services like showers and a laundry room (okay, to be fair there was a scary looking building marked restrooms and laundry but I didn’t dare look inside). 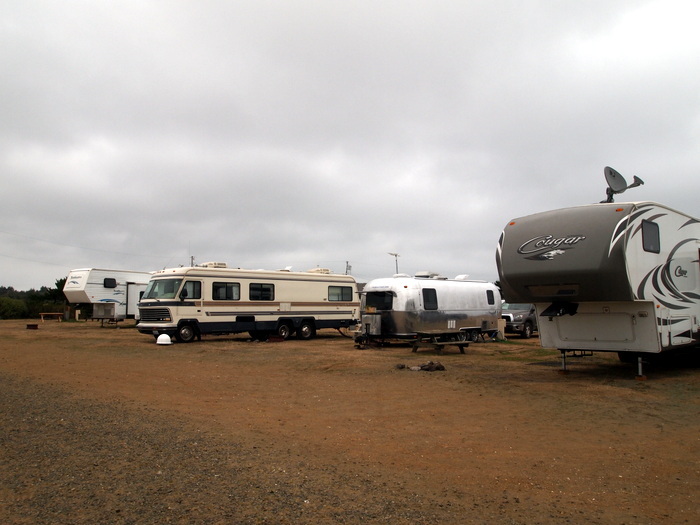 In short, what you get here is nothing more than a dirt parking lot divided into narrow sites with water-logged picnic tables and rusty fire rings. It doesn’t matter though because you’re not here for the site, or the showers, or any of that other stuff. 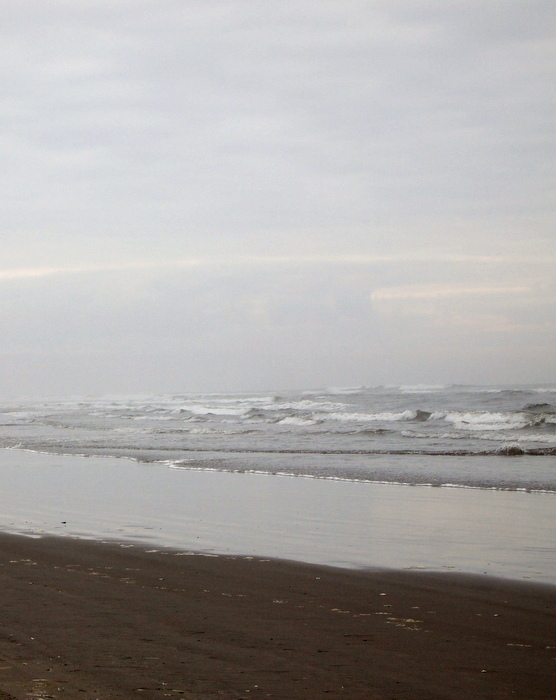 You’re here because of the wild, pristine stretch of beach right outside your door. 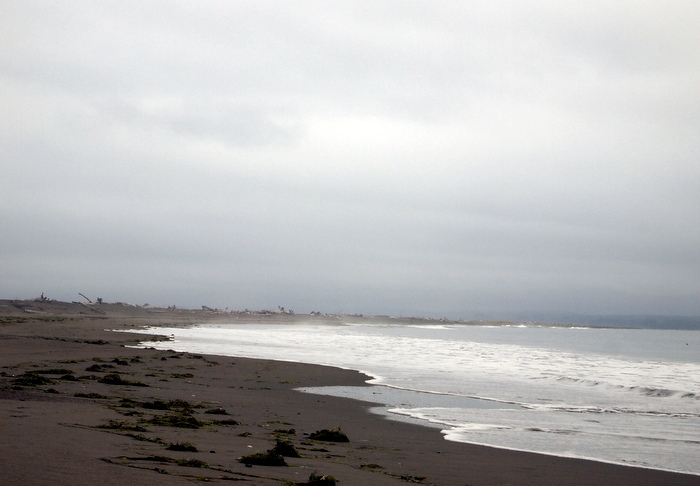 You’re here because on rainy days you can watch the surf from your window, and on not so rainy days you can stroll down the mile and half slice of deserted beach that curves into north bay. 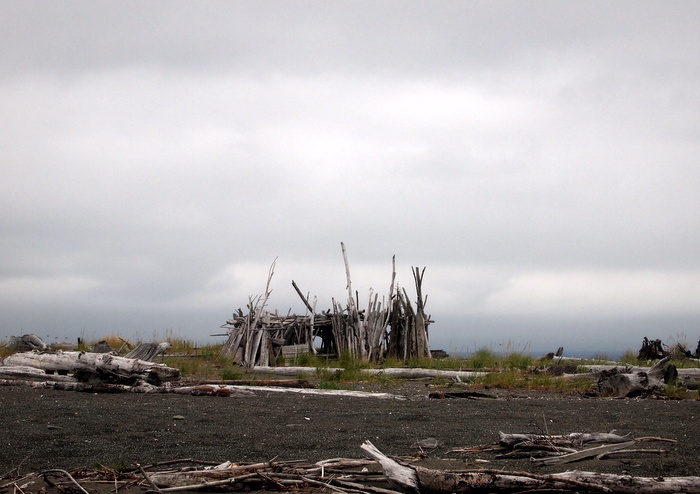 It’s one of those rare beaches void of human development that beckons for exploration by foot. 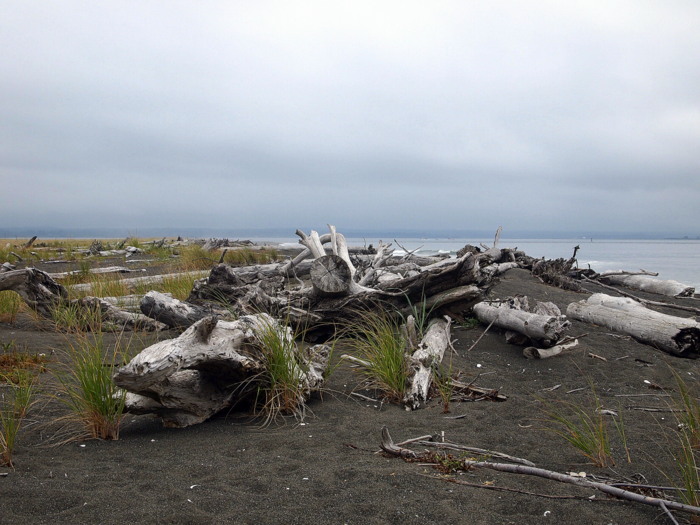 Away from the water, the beach is filled with soft yellowing dune grass with driftwood logs strewn about. Closer to the surf the sand is fine and the beach is wide and flat with bits of shells scattered among the seaweed. 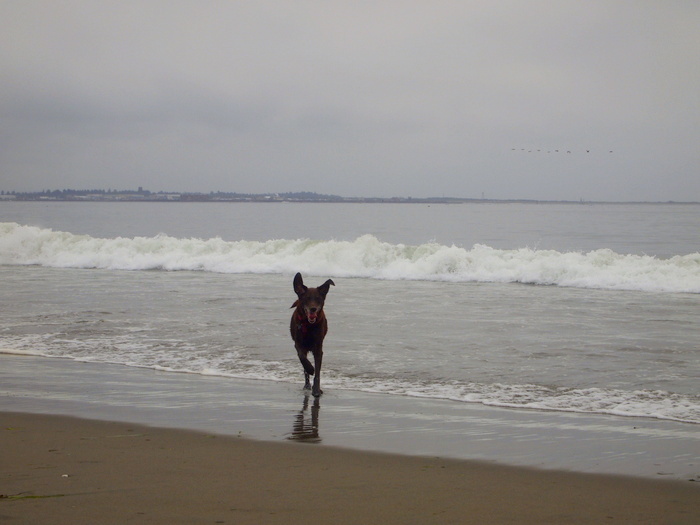 Phineas enjoyed darting in and out of the waves. 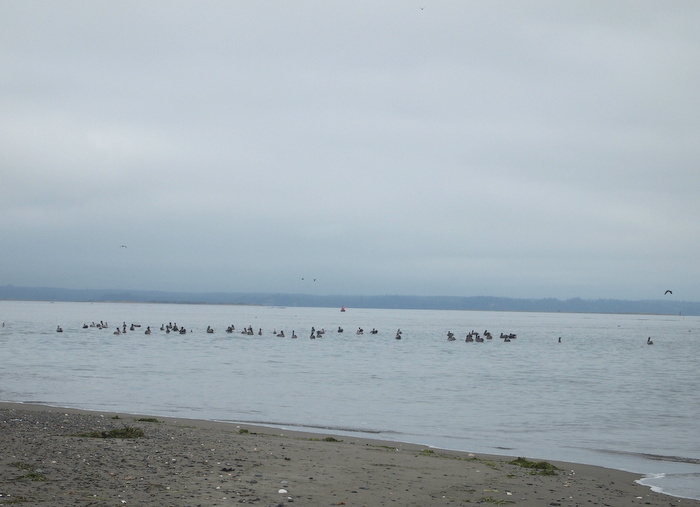 We walked to the end of the beach where a flock of pelicans floated just off shore occasionally diving under to snag a fish or two. Much to my delight we also spotted some seals frolicking around in the surf. None came close enough to get a good picture, but I swear one of them was looking right at us as he bobbed his cute little head above water. 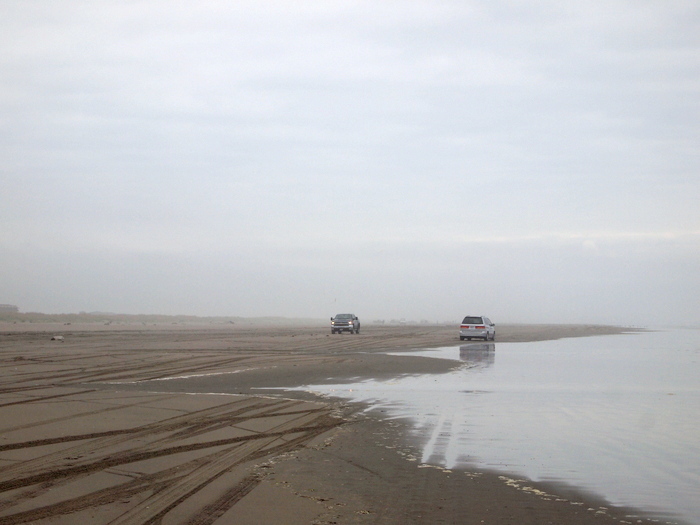 Besides walking on the beach, the other fun activity in Ocean Shores is driving on the beach. Tim was pretty excited when he discovered that the beaches in this town are considered state highways! 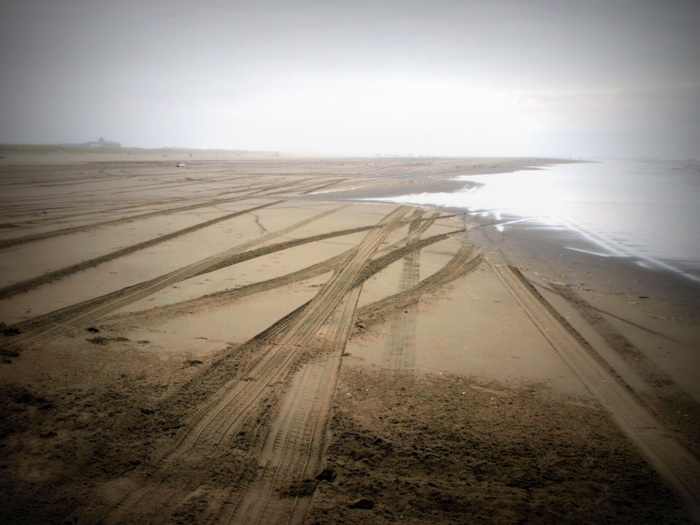 This means as long as you follow the rules of the road (er…beach) you can drive almost anywhere you want. The rules are pretty simple: 25 mph speed limit, no driving in the surf or on the dune grass, no donuts, all vehicles on beach must be registered, anyone driving on the beach must have a valid license, helmet law applies and no driving under the influence of drugs or alcohol. There are numerous access point to the beach, and after spotting one during a drive around town we had to try it. 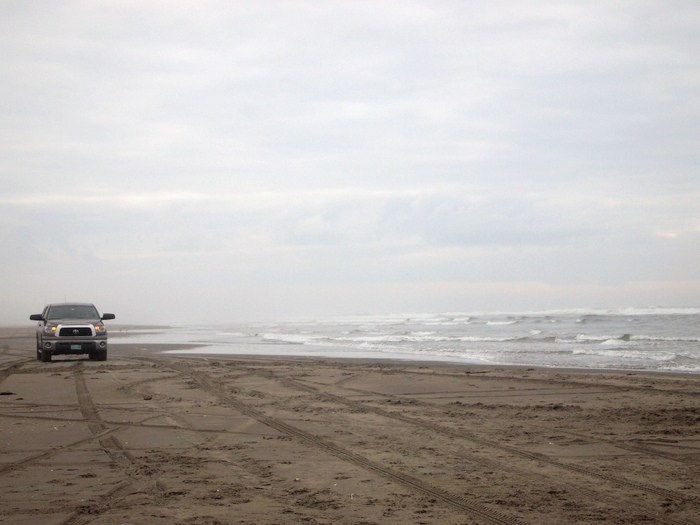 There were plenty of other vehicles out enjoying the beach that Friday afternoon. We saw lots of trucks, a minivan, a Subaru, a VW Jetta and even a Prius cruising along the shore. After driving for about 10 minutes we parked and walked along the water’s edge watching the waves come in. 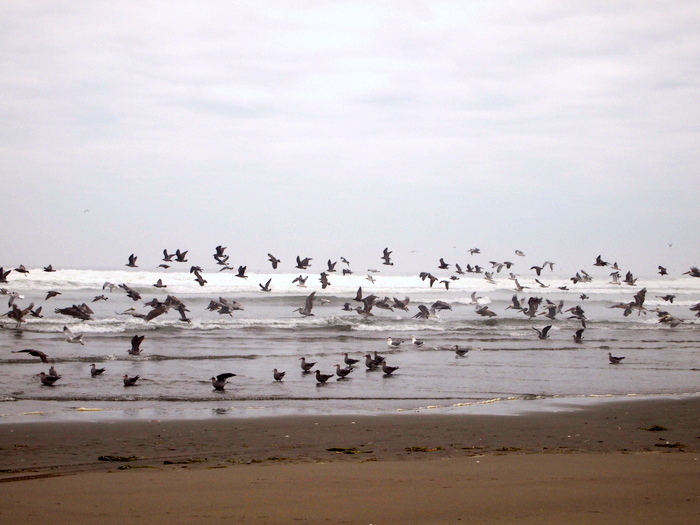 There were huge flocks of birds lining the shore. 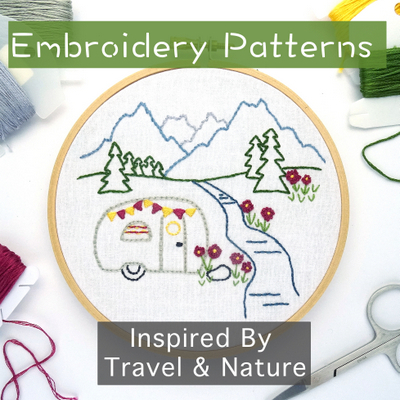 They would all congregate in one area and then suddenly take to the sky with their wings flapping noisily in the breeze. 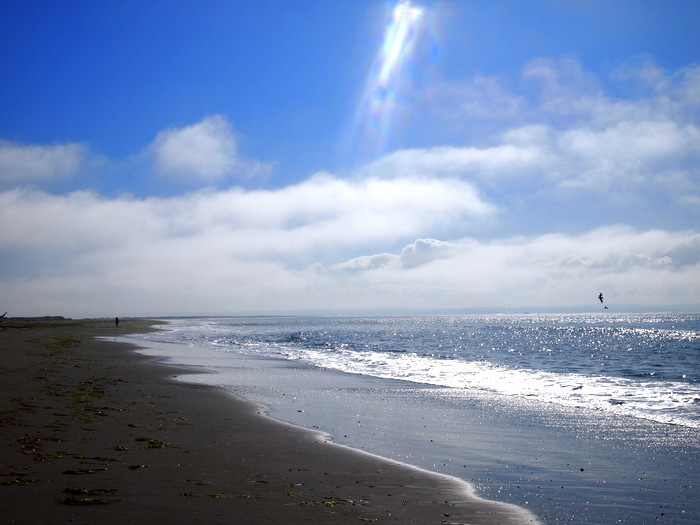 On the morning we left Ocean Shores the sun finally broke through the fog. 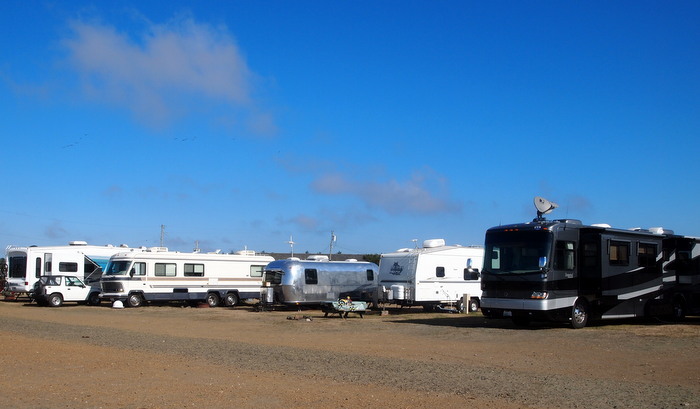 It was a Saturday morning and the campground had really filled up the night before. The beach was busier than we had seen it since we arrived. Kids and adults all came out to celebrate the sunny morning. 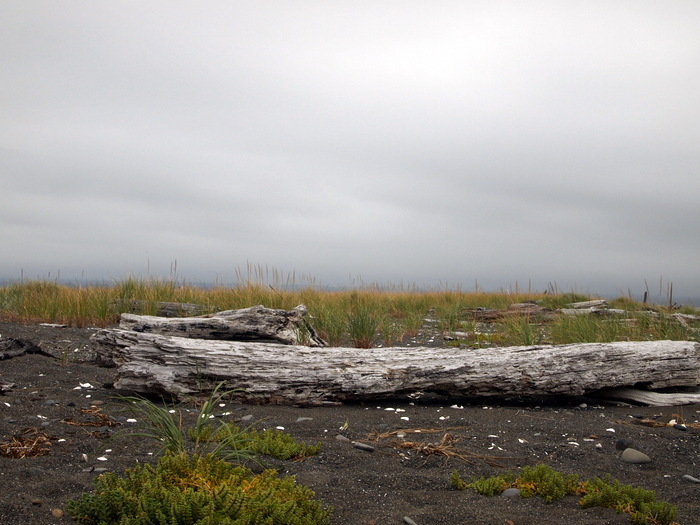 Ocean Shores was our last stop in Washington. Wow, what a state it is. High dessert, wheat fields, jagged snow capped mountains, endless stretches of beach, tiny historic port towns, big high-tech cities — I think Washington has it all. Of course, yet again we only saw a fraction of the state. Which means that, yet again, we look forward to a return visit. For now though we move south into Oregon where more beaches, mountains and funky towns await.